You received without paying; give without pay. 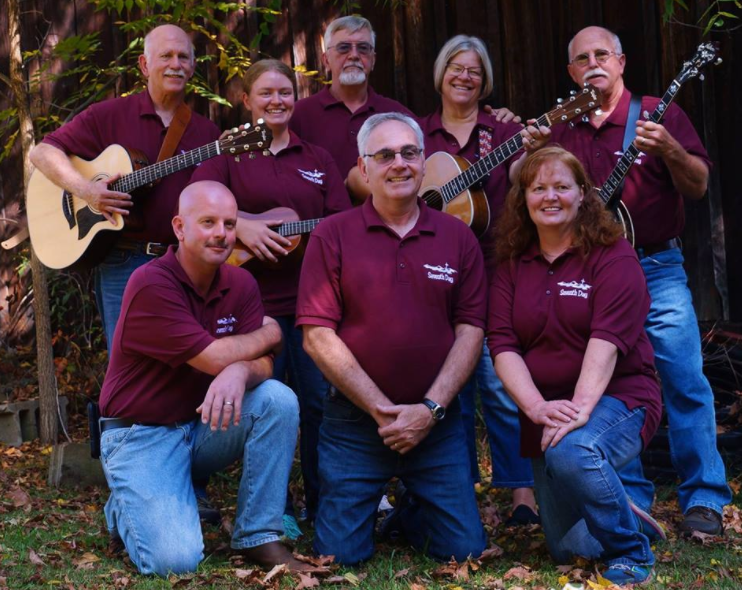 Seventh Day, is a singing group from the Meadville / Saegertown area. We sing mostly, 'Christian', 'Faith and Family', 'Country Gospel' and some contemporary based songs. We LOVE to sing and play music glorifying God. We are a group, Not claiming to be professional, just claiming to have fun and to enjoy singing for the Lord. We sing Country Gospel, some contemporary songs as well. (Not really 'dyed-in-the-wool' any particular kind of group. A group without a label :) !! ) Come hear us sometime and sing along! You might just enjoy it! Top row, (left to right): Larry Miller, Jenny McMann, Ardean Ridgeway, Nancy Stevens, Mike Butler. Bottom row, (left to right): Sean McMann, Don Miller, Carole McMann. In our group, Seventh Day ,we have, Larry Miller, (guitar player); Jenny McMann, (ukulele player, and webpage design); Ardean Ridgeway, (bass singer); Nancy Stevens, (guitar and mandolin player); Mike Butler, (banjo player); Sean McMann, (tenor singer); Don Miller, (tenor singer); Carole McMann, (singer). Not pictured is our new bass player Justin McMann. Roger is our video and audio guy. ​Thanks to all of them. We are truly blessed! *When times are not yet set they will appear as 12:01 am.